The Watershed Conservation Resource Center (WCRC) partnered with the City of Fayetteville (City) and US Environmental Protection Agency Region 6 (EPA) to restore a section of Niokaska Creek that flows through Sweetbriar Park. The stream restoration project was funded with an EPA grant and the City provided required matching funds. The project was initiated in November 2009, construction & re-vegetation was completed in May 2012, and follow-up maintenance and monitoring will continue through 2013. A 1,600 foot section of Niokaska Creek that flows through Sweetbriar Park, a city-owned neighborhood park located in the Illinois River watershed, was restored. An increase of urban areas and impervious surfaces over the years has altered the hydrology of Niokaska Creek resulting in channel enlargement. Several extreme vertical cut-banks had formed at the project site that eroded as much as 10 feet per year, contributing an estimated 600 tons of sediment and 200 lbs of phosphorus annually to the stream system, and undermining the surrounding riparian area. The WCRC utilized natural channel design principles to reduce channel instability, reduce sediment and nutrient loadings, and increase aquatic and terrestrial habitat. The design included constructing small floodplains, rock structures that deflect flow away from banks, defined riffles and pools, and wetlands in flood-prone areas adjacent to the stream. A rock structure was used to gently reduce the elevation drop that was created by a water line crossing the stream. Following construction, soil mattresses were built and the site was re-vegetated with native grasses, shrubs, trees, and wildflowers. Niokaska Creek just after construction. Re- Vegetation process beginning. that exceeded the design flow by five times, yet the restoration project performed exceptionally well. 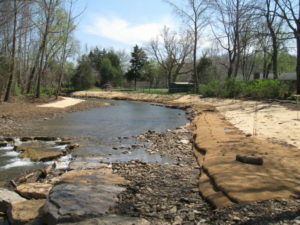 The immature project prevented 1) 35 to 50 feet of streambank erosion, 2) the potential loss of 5% of Sweetbriar park land, 3) damage to the water line, 4) excessive inputs of sediment and nutrients from entering the stream system from erosion, and 5) the loss of 5 to 10 mature trees. Although not a single tree was lost and none of the previously occurring erosion continued, the project sustained some damage. A portion of the soil mattress washed away and a rock sill was scoured out near the water line. The damage has been repaired and with the help of local volunteers, native vegetation was planted throughout the site. The WCRC continues to monitor and maintain the project to evaluate effectiveness and ensure the quality of the finished product. To date, the project has already prevented severe erosion and reduced potential safety concerns, while improving the beauty and biological function of the Niokaska Creek. By utilizing a natural channel design approach, the quality of our natural and water resources within the urban environment are improved for the enjoyment of the public who call Northwest Arkansas their home.